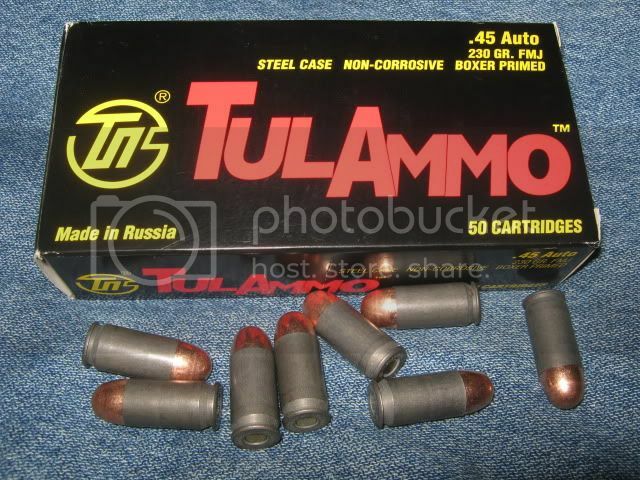 This russian made full metal jacket, steel cased ammo can be found online and in most wal marts for decent prices. Ive had very good luck (in the thought that it fired every time) with the pistol caliber ammo. I havent had time to test out the rifle, though interwebs say it should perform like wolf, as they were former producers of it. I tested the 45acp in my kimber during an action shooting match in December. While I didnt score so high (I was still used to me lower recoil reloads), I did complete every stage without a hiccup and got some decent Alpha hits. Close range shots grouped a little wider than normal, and shooting at max distance was challenging. after the match the gun was noticeably dirty, but was still able to function normally. The 380 was tested on my beretta 84 at a 6x6 steel square, from about 20~ feet, dinged it every time. mind you, there is a notion that steel will wear out parts, such as the extractor or ejector (there is a difference) faster than brass. I havent committed to a long term test but there is a writer/shooter that i follow who will shoot this ammo exclusively this year. I will circle back and post his results and his opinion as it comes in.